Around 75% off our world is made up off water. And that may seem that life on earth has an endless supply of it and will never have water problems at all. This is far from the truth however, as in reality, only 1% off all the water on the planet is suitable for human consumption and only 3% is suitable enough for agricultural purposes. All the other water is too salty or is frozen in glaciers. Let us first examine how we spend water in the normal field crop or our potted plants. We sprinkle water in it and in sprinkling alone, water is already wasted because it is not directly put in the roots and goes through other places. Now the plants absorb the water that remains and then water drips out of the bottom of their container or seeps further into the ground. Water is again wasted. Hydroponics solves this problem with what they call recirculating nutrient reservoir. One of the benefits of growing hydroponically. With hydroponics the water is directly delivered in the root of the plant so we just need to spend a smaller amount of water for the plants to get the nutrients it needs. Furthermore, the excess water used in the hydroponics system is then collected in a tank or reservoir to be used again during the next irrigation cycle. Some hydroponics system even do other water conservation ways to further save water like capturing the water vapor in the air. This is possible by putting water vapor condensers in front of the exhaust fans of the greenhouse that will capture much almost all the water vapors in the greenhouse. 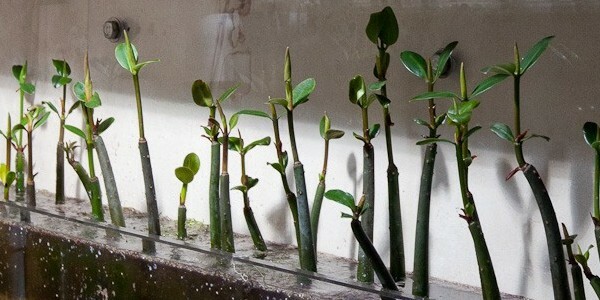 Some also harvest rainwater and then purify it to use it at their hydroponics system. Rain water is a free resource and depending on how what state you are, you can get as much as 25% percent higher water supply through rain waters. Water conservation is not the only advantage of Hydroponics. It can also eliminate the use of pesticides, fertilizers and herbicide. it also gives more control to the gardeners and they can plant crops anytime of the year. This only proves that hydroponics is the way to go today. There are tons of other resources online that we recommend and will give you tips when growing if you're still stranded. Can I Save on Lighting Expenses Growing Outdoors?